You may not have access to use the Surround SCM desktop client in some cases, such as when you are working from home, at a customer site, or in a QA lab. In this case, you may be able to use Surround SCM Web to work with files. Surround SCM Web 2016.1 introduces the ability to check in files, which helps you share changes with other users when you cannot access the desktop client. Click the filename in the Contents tab on the Source tab. In the Check In File dialog box, click . Browse to select the File to check in and click Open. The filename is added to the File to check in field. Select the file Version to change. Make sure you select the correct version. Select Skip server auto-merge to check in the file without merging changes. The checked in file becomes the new version even if another user changed and checked in the file before you. Select Update version even if no change is made to increment the version number even if you did not make changes. You may want to select this option if you are working with related files and always want the version numbers to match. This can help you and your team visually confirm that files are in sync and changes were not missed. For example, you work with two related files: WysiWrite.cpp and WysiWrite.h. Both are currently version 29. You make changes to WysiWrite.cpp. 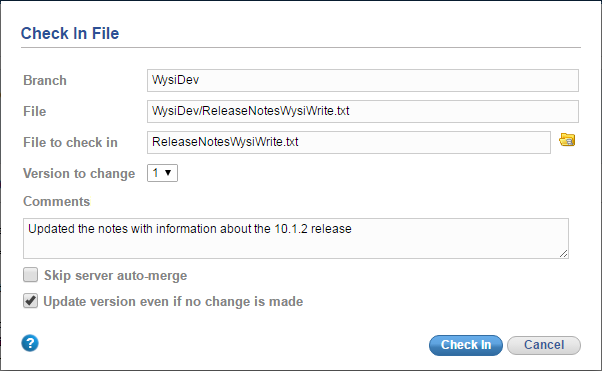 WysiWrite.h does not have changes. If you select this option at check in, both files are updated to version 30. If you do not select this option, WysiWrite.h remains at version 29. Click Check In to check in the file. If you already use the Surround SCM desktop client, note some limitations and differences to consider when checking in files from Surround SCM Web. You can only check in one file at a time. You cannot check out files and working directories are not used. You cannot check in files if your team requires using changelists, adding files to code reviews, or attaching files to TestTrack at check in. Use the desktop client to check in files in these scenarios. File dialog default user options for check ins set in the desktop client are ignored. A handy tip about managing the file versions when using Surround SCM for check ins: When you get a file from Surround SCM that you plan to change, note the version number so you can select that version at check in. When checking in from Surround SCM Web, you must manually select the file version you retrieved and changed. Surround SCM needs to know the version you started with so it can correctly merge your changes with other users' checked in changes. In the desktop client, you do not need to select a version at check in because version information is automatically tracked in the .MySCMServerInfo file in your working directory, which is not used by Surround SCM Web. See the Surround SCM Web help for more information about checking in files.